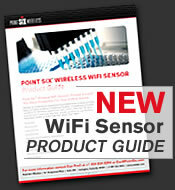 Point Six™ Wireless is one of the world's leading manufacturers of wireless temperature sensors. You may not have heard of us because our temperature sensors are sold under other brand names such as Honeywell, Schneider Electric, Automated Logic, Vaisala and AmegaView™ to name just a few. Point Six™ Wireless award winning temperature sensors monitor the temperature of perishable items in transit, priceless blood and tissue products in healthcare facilities, and fragile environmental conditions for laboratory research and data centers worldwide. *AmegaView™ is a trademark of Mesa Labs.